Product prices and availability are accurate as of 2019-04-09 07:23:51 EDT and are subject to change. Any price and availability information displayed on http://www.amazon.com/ at the time of purchase will apply to the purchase of this product. 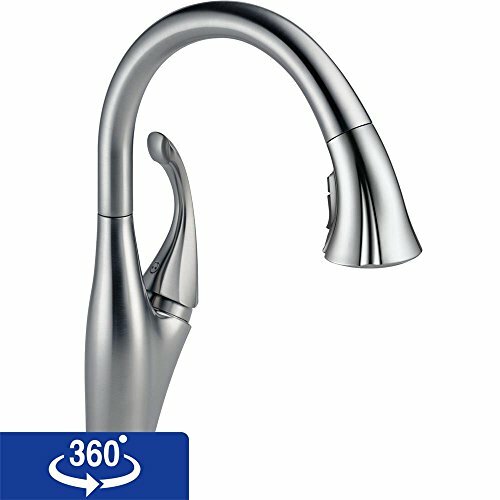 Sleek with beautiful curved lines, this faucet is the perfect way to stylishly upgrade your kitchen. This faucet features a convenient single handle, pull-down lever and a design inspired by the fragile scallops of a sea shell. Faucet type: Kitchen Number of handles: Single handle Faucet finish: Chrome, arctic stainless Swivel arm Battery operated (6 AA included) for up to 2 year battery life or 6 C (not included) for up to 5 year battery life Faucet style: Pull-down Handle shape: Lever Spout reach: 10-11/32 inches Faucet height: 15-3/8 inches Spread: Single hole High-arc pull-down swivels 360 degrees Euro-motion Diamond valve Touch feature to activate on/off Multi-flow delivers both 1.5 gpm stream and spray settings for water efficiency and 2.0 gpm stream setting for high performance MagnaTite docking AB1953 certified (lead free) Model: 9192T The digital images we display have the most accurate color possible. However, due to differences in computer monitors, we cannot be responsible for variations in color between the actual product and your screen.